I love history (especially Minnesota history), and I love music. So the recent event at the Minnesota History Center*, Trail of Two Cities with Dan Chouinard and Friends, was just my kind of thing. I became familiar with talented pianist/accordionist/storyteller Dan Chouinard years ago through the dear, departed, MPR Morning Show, and have seen him in many concerts since, including his Cafe Europa show (about his adventures bicycling around Europe with an accordion) and Steerage Song (last summer's collaboration with Theater Latte Da). 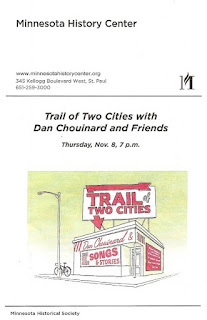 In Trail of Two Cities, Dan brings his music/storytelling format to these two beautiful cities we call home, and more specifically, to how we travel between them. Dan travels by bicycle as much as possible, which I hugely admire and envy. He encouraged the audience to bring the mindfulness necessary when traveling through the city by bike to however we travel. There's a reason the roads we travel on are where they are. 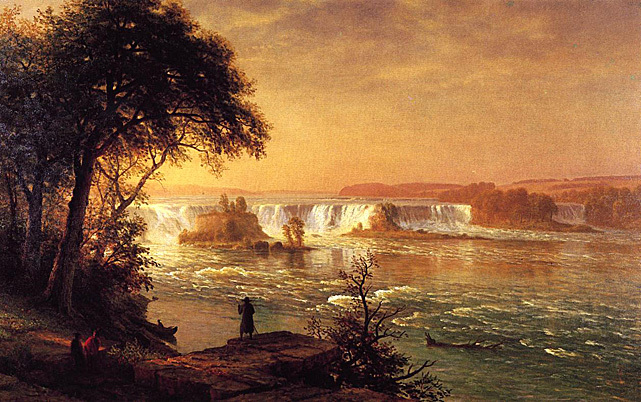 The show reminded me a little of The History Channel's series How the States Got their Shapes, only with local landmarks like the crosstown (a way for livestock trucks to bypass the city) and University Avenue (an old Native American trail from the falls of St. Anthony to the bend in the river). Horse and buggy - a sing-along to "Surry with the Fringe On Top"
Trains (a 30-45 minute trip in the late 19th century) - "The Wabash Cannonball"
Streetcars (which took over the train business in the early 20th century until their demise in 1956) - "Clang Clang Clang went the Trolley"
Highways (first built in the '50s and '60s, 94 was built straight through the African American neighborhood of Rhondo) - "Drive the USA in Your Chevrolet"
It was a fascinating trip through local history that made me want to learn more. It also made me want to move from the suburbs into the city so I could make use of the growing public transportation (the streetcars return!). The show reminded me of my desire to take the train to Chicago for a theater weekend, and float down the Mississippi to New Orleans on a riverboat. I'm not sure if the latter even exists, but the former definitely does, and especially now that the Amtrak is moving back to the newly renovated historic Union Depot in St. Paul, I'll be sure to do that soon. Thanks to Dan and Friends for exploring the ideas of local travel in such an entertaining and musical way! *The Minnesota History Center's auditorium is a nice venue (I'd previously seen a History Theatre production 1968 there), and it's a great museum. I've been wanting to see their current exhibit on the US-Dakota War of 1862 and was hoping to go that afternoon and make a day of it, but unfortunately they closed the center between museum time and event time. I'll have to go back another time, perhaps in conjunction with another event.